Our client is a full-service boutique market research firm adept at combining state-of-the-art market research techniques with inspiring designs to ensure research findings are clear, concise and actionable. 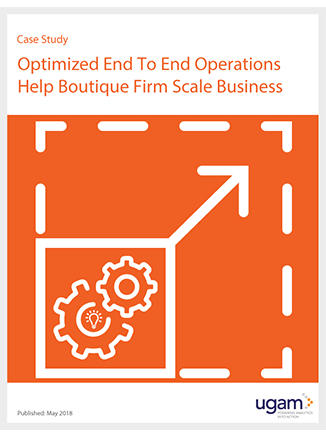 As they scaled their business, they faced several operational challenges like resource flexibility, lack of infrastructure setup, lack of modern technologies and automation and undefined processes. Learn how Ugam with its domain knowledge and technical expertise among other capabilities helped the firm focus on the client’s needs and maintain a competitive edge.